Log in to your account at Casino of Dreams and for a qualifying payment, you can receive a 25% bonus up to £250. Use this bonus to gamble on all the games you desire and have tons of fun! Keep in mind that deposits made with Neteller, Paysafecard, and Skrill are not valid for this offer. Wager the bonus amount 50 times before you make any withdrawals. Get this deal and enjoy your time! With a wide variety of games that can fit every taste, what more can you wish for from an online casino? But that’s only a drop in the bucket because Casino of Dreams has other surprises prepared for you like this amazing welcome package. Take into account that deposits made with eWallets such as Neteller, Paysafecard, and Skrill are not valid for this bonus. Wager the bonus amount 50 times prior to any withdrawals. You can cash out a maximum of £100 from the spins. Grab this generous offer and enjoy the perks it comes with! Casino of Dreams is the perfect platform for you if you desire to start your gambling adventure. This site has it all from high-quality games to an optimized mobile app. Novices that sign up on an adventure at Casino of Dreams can benefit from an exciting first deposit bonus. 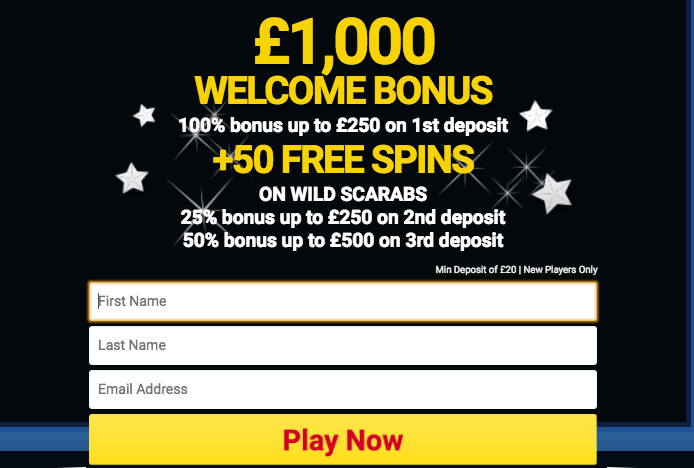 Access the casino from this page, create an account, and make the qualifying deposit to receive a 100% bonus up to £250 plus 50 spins valid only on Wild Scarabs. Only deposit made with Mastercard, Visa or Maestro are accepted for this offer. Wager the bonus amount 50 times prior to any withdrawals. Take into account that you can’t cash out from this offer more than £100. Enter the world of amazing treats and have some fun! Gamble your way to the top with this amazing reload bonus that you can obtain on your third deposit. At Casino of Dreams, all existing players are invited to grab this 50% bonus up to £500. You only need to deposit a minimum of £20. Deposits made via Neteller, Skrill, and Paysafecard are not valid payments for this promotion. Other banking methods stay at your disposal. This deal comes with a 50-times wagering requirement on the credited bonus. Are you ready to have more fun than you’ve ever imagined? Get this deal and enjoy the ride!